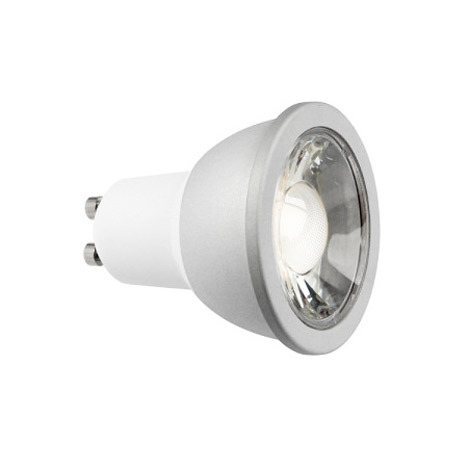 This 7 Watt Dimmable GU10 LED Bulb has a Single COB Diode with a single Lense, draws 7 Watt with a 45 degree light spread and is cULus Listed for indoor and Damp Locations. Stocked in Vancouver, BC Canada. Low Voltage LED MR16 COB version also available. This GU10 also avaialble in Warm White 2700K. Our newest and brightest Dimmable COB GU10 7 Watt LED Bulb, is a standard twist in line voltage (120V) MR16/GU10 Replacement bulb thats dimmable and damp location rated. Easily Replacing a 50 Watt halogen to LED.